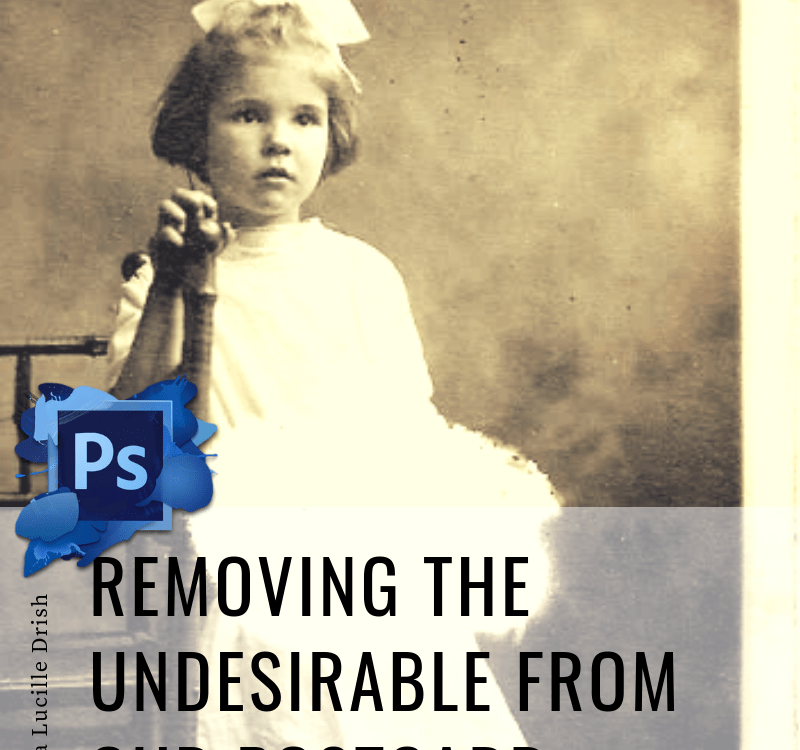 Over the next couple of days we will be restoring a damaged photo postcard from my personal collection of little miss Emma Lucille Drish. Follow along and you can do the same with one of your own photographs. We are super excited to announce a new project series on the Welsh of Harpers Ferry today: Adobe Photoshop for Genealogists. Adobe Photoshop is a the biggest name in the photo editing industry (and has been for a long, long time), allowing you to easily accomplish difficult image editing tasks. Can we use this tool for genealogy? OF COURSE. 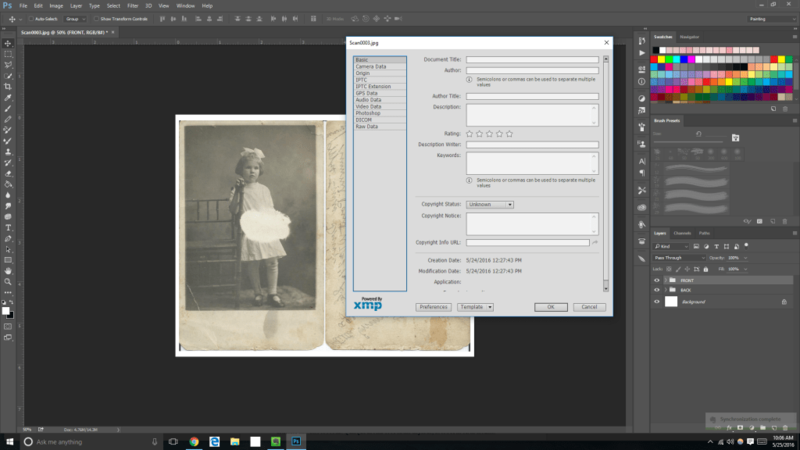 Adobe Photoshop is hands-down the best tool for restoring your aging, historic photograph collection that I have ever come across. In order to follow along with this series, you'll need to have a couple of things ready. You'll need to have Adobe Photoshop installed and ready to go on your computer. If you don't already have this program, Adobe Photoshop is a paid product. You can purchase Adobe Photoshop as part of the Photography Plan for $9.99/month. Adobe also offers a full 7 day FREE trial if you'd just like to have the program long enough to follow along with our series. Or, a way to get the image you want to restore onto your computer screen. If you would rather follow along with the image that we are using, it is available for download here. In this post, we will cover my favorite way to set an image file up to be edited along with some best-practice tidbits. Let's go ahead and open up Photoshop and get started. First, we need to get that postcard or photograph from your hands into Photoshop. I can’t tell you quite how to scan your image in -- everyone’s scanner is different! Make sure you scan both the front and the back of the postcard or photograph. I do this even if the back of the image has nothing on it. I like knowing that the entire image has been preserved -- If something was to happen to the original, I would still know what the entire front and back looked like. Open up both of these scanned files into your Photoshop using the File → Open command in the top menu. For editing purposes, I like to put the front and the back of the image on one screen, or canvas. Once the image is completed, you can switch the front and back into their own separate files if you wish. Working with the front of the postcard, right click on the “Background” layer and select “Layer from Background…”. Name this new layer “Original Image - Front”, and hit OK. Create a new layer by clicking the create a new layer option at the bottom of the layers palette. The icon looks like a sticky note with the corner folder up. This should create a new layer named “Layer 1” above our “Original Image - Front” layer. In the top menu, select Layer → New → Background from Layer… This will convert “Layer 1” into a “Background…” layer beneath our “Original Image - Front” layer. Basically what we did was remove our image from the background to give us a little more room to play. Now we need to increase the size of the image canvas (NOT the actual image) to give us more room. This way, we can look at the front and back of the original postcard in the same image. To do this, select Image → Canvas Size in the top menu. We want to double the width of the image. In theory, the height should be the same for the front and back of the image. Select “Percent” in the drop down box beside Width. The drop down box beside Height should automatically adjust to “Percent” as well. Enter “205” as the width, and “105” for the height. We are essentially giving ourselves a 5% allowance for human cropping error. We will crop the whole image down together to get it just right when we are finished with our restoration. Move the “Original Image - Front” layer to the left side of the canvas in order to make room for the back of the photograph. Now, we need to grab the back of the photograph and move it onto the image with the front of the photograph already on it. On the image of the back of the photograph, hit Select → All in the top menu. This should give you little marching ants all the way around the image. On your keyboard, hit the Ctrl key and the C key at the same time to copy the selection. Going back to the front of the photograph, hit the Ctrl key and the V key at the same time to paste the back of the photograph onto the image with the front of the photograph. If you look in your layers palette, this layer is named “Layer 1”. Rename it to “Original Image - Back”. Move that layer to the right of the canvas. I’ve also flipped the “Original Image - Back” layer horizontally in order to keep it just like if you flipped the postcard over. If you need to do the same, hit the Ctrl key and the T key at the same time to select the transform tool. Right click and select Flip Horizontal. We want to keep our layers palette a little bit organized so we can find what we are looking for later. First, let’s create folders for the front and the back of the image. To do this, click the folder icon that says “Create a new group” in the bottom of the layers pallette. Click this twice to create two groups: “Group 1” and “Group 2”. Rename these groups to “Front” and “Back”, respectively. Click and drag the two “Original Image” layers into their correct folder. The entire purpose of restoring a photograph is to remember the photograph in, number one, it’s original glory, and, number two, to preserve the photograph for future generations. With this fact in mind, let's do some quick spring cleaning for both ourselves and others whom we may share this image with. I like to keep all the known information of a particular photograph with that particular image file. There are literally hundreds of ways people tend to do this, but I think the most efficient and most sensible way to do this is through the metadata of an image. In Photoshop, it’s really easy to edit the metadata. In the top menu, select File → File Info… A box will pop up allowing you to enter a whole lot of information about this particular image. A view of Adobe Photoshop's Meta Data Panel. STEP IV: Use this link to figure out what to put into the metadata fields, but you should be most concerned with the title, the description writer (your name), a description, keywords, date taken, place taken, and the source of the image. If you scroll through the tabs, you may find more boxes that you may wish to fill in. Hit “OK” when finished. DON'T FORGET TO SAVE YOUR WORK! Now that you’ve gotten your file set up to be edited and preserved for future generations, don’t forget to save it! You can do this by selecting File → Save As in the top menu of Photoshop. Remember to save it with a slightly descriptive filename! I’m saving it as “Emma Lucille Drish”. Be sure to save it as a .PSD, so that our layers are preserved for further editing. We’ve Gotten Our Image Set Up And Ready To Edit! Our image is now completely set up and ready to edit. We’ve even upped the ante of digital preservation with metadata which now goes wherever our image goes. (Now everyone will know forever who this is a photo of!) I think that this is enough work for one day. 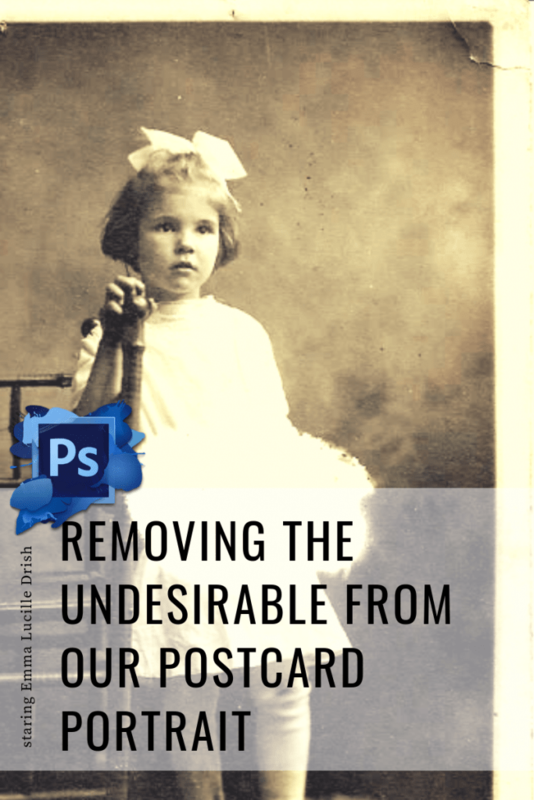 Catch us in the next post to start actually restoring this old photo postcard bit by bit! Please leave your questions in the comments; I'm happy to help! Wife, mother, animal lover, and family historian who vows to leave no page unturned and no ancestor forgotten.